Our partner, HubSpot, is an inbound marketing and sales platform that helps companies attract visitors, convert leads, and close customers. They have plenty of resources available to its partners including; training, whiteboards, e-books, webinars, pdf downloads, and more, keeping us up to date on the latest marketing tools and trends. One of the highlights of HubSpot is their growth platform. HubSpot Growth Platform - what is it? 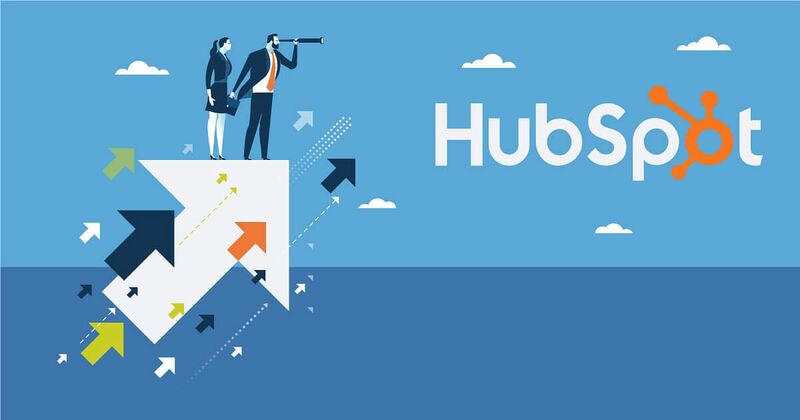 HubSpot’s CRM Hub is a place where you can connect with your clients and grow your business with a happy team. It’s the centrepiece of the growth platform that pulls from each of the other three Hubs and combines it. Here’s a run-down of the main features that make our life easier. Conversations. With conversations,you can now respond to customers in one central place. Bring all of your conversations together here from all over the business - messages from live chats, team email, and Facebook messenger. Contacts & Companies. Organise your contacts and all the information you have about them in one simple, unified place. You can create custom fields, look at past interactions, and communicate with contacts all with HubSpot CRM. Deals & Tasks. This CRM hub allows you to track and manage customers anywhere on the sales funnel and their entire customer lifecycle. You can organise your tasks and assign them based on the stage your client is, getting more deals. The best thing about the CRM hub? It’s completely free. Talk to us today about how to start your HubSpot journey. HubSpot helps you create engaging content with their Marketing Hub. Also working in close contact with the other three pieces of the growth platform, this hub focuses on content and how you can personalise it for your target audience to see the most out of every piece. There are a ton of features you can access in this hub - here are some of the features that we love using. SEO & Content Strategy. HubSpot can help you learn the ins and outs of SEO and how it should play a role in your content strategy. Easily organise and plan your pillar and cluster pages, monitor performance, and watch as your content goes up in rankings. Blogging, Conversion, and Social Tools. The tools within the marketing hub go a long way. You can use them to create and optimise blog content based on HubSpot’s recommendations. Build landing pages to capture new leads and use the social tool to share all of your content, leading them back to landing pages. Each tool is easy to use and track. Reporting. What marketing manager doesn’t like an attractive, easy to understand report? With the Marketing Hub, you can create beautiful reports based on any metric you wish, even integrated apps! The best thing about the Marketing Hub? You can automate nearly all of it. If you're interested in lightening the load, and want to know how you can begin automating your work load, check out our FREE PDF Guide. We have put together this helpful guide to showcase how you can automate many of your daily tasks, saving tiem and increasing efficiency. The aim of the sales hub is to build an effective strategy that is going to turn your leads into delighted customers. The CRM hub plays a big part here, keeping live chats and all conversations in one place so the sales team can respond accordingly. Share helpful documents with your team and follow up seconds after a customer asks a question. Templates, Sequences, and Snippets. With the service hub, you can create templates for every stage of the funnel and automate them to be personalised for each recipient. Create email campaigns based on these templates with Sequences, and save yourself some time on phrases or quotes you use regularly by saving them in Snippets. Recommendations. A second set of eyes never hurt anyone! HubSpot’s sales team will score your sales templates and offer suggestions on how to make them more useful and personalised for your prospects. The best thing about the Service Hub? Your marketing and sales team work efficiently together. Tickets. Help your customer service team deal with customer problems by assigning each query with a ticket number and designate a team member to it. This way they can track each query in a central location, sorting problems faster. FAQs. Create a knowledge base in your services hub with all of your frequently asked questions. Other team members can resort back to this base and get simple problems handled quicker. Meetings. Customers can book their own meeting with any member of your team through the services hub. As they are booked, the growth platform will automatically create new records in your CRM. The best thing about the services hub? You can send out surveys to gather feedback. Combined, the HubSpot growth start is a recipe for success. And the best part about all of this? ExtraDigital has been practicing the Inbound Methodology for years and we have our eyes set on becoming the South's leading HubSpot Partner. Therefore, know all the ins and outs of the platform. So, if you’ve got any questions, or want to find out more about our partnership with HubSpot - just ask! Like this article? Share with your colleagues!